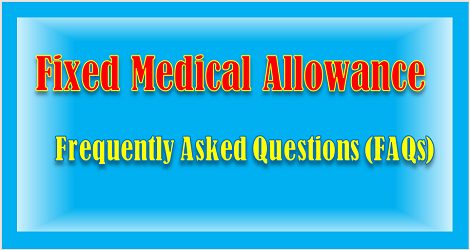 (4-1) What is the Fixed Medical Allowance for pensioners? What is it’s amount? In accordance with Office Memorandum No. 45/57/97-P&PW(C) dated 19.12.1997, Central Government pensioners/ family pensioners residing in areas not covered by Central Government Health Scheme administered by Ministry of Health and Family Welfare and corresponding Health Schemes administered by other Ministries/ Departments for their retired employees are entitled to Fixed Medical Allowance (FMA) for meeting expenditure on day-to-day medical expenses that do not require hospitalization. Government pensioners/ family pensioners residing in CGHS covered areas are eligible to avail medical facility under CGHS for both indoor as well as outpatient treatment on payment of CGHS contributions. Those pensioners/ family pensioners residing in CGHS areas who do not opt to avail CGHS facility are not eligible to receive FMA. Government pensioners/ family pensioners residing in Non- CGHS area are also entitled to avail CGHS facility from the nearest city covered by CGHS for the both Indoor and OPD treatment on payment of CGHS contributions. If they do not avail CGHS facility, they are eligible for FMA. Government pensioners/ family pensioners not residing in CGHS area have an option to avail CGHS facility from the nearest CGHS city for Indoor treatment only (on payment of CGHS contribution) and to get monthly FMA in lieu of OPD facility.